Two New Aftermarket Replacement 10 Inch Wide x 28 Inch Diameter Rim with 6 mounting loops / clamps. 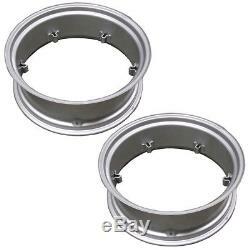 For Ford Tractors using 10 x 28, 6 Loop Rims. For Ford Tractor models : 2N, 8N, 9N, Jubilee, NAA, 501, 600, 700, 800, 900, 2000, 3000, 4000 Series. 3310 3400 3500 3600 10-28 10 28. For Many Oliver Super 55 550 1250 Others 10-28 10 28. For Case 470 530 531 540 541 570 580 630 10-28 10 28. For Many Allis Chalmers ED40 RC WC WD 10-28 10 28. For John Deere 1840 2020 2040 2750 2755 2940 10-28. For Massey Harris Colt 21 50 101 102 JR 10-28 10 28. For IH International 484 606 674 2444 10-28 10 28. For Many David Brown 770 880 Others 10-28 10 28. For Many Cockshutt 20 Deluxe 540 Others 10-28 10 28. For Many Minneapolis Moline Tractors 335 10-28 10 28. For Fordson Super Dexta Others 10-28 10 28. For Ford Golden Jubilee 233 234 333 334 335 501 541. For White Tractors 2-44 OTHERS 10-28 10 28. For 11.2 x 28 inch tires. Backspacing Measurement (from Outer Edge to the Loop): 2.50. PLEASE NOTE: To determine your Rim Size, measure inside to inside (Bead To Bead). Replaces Part Numbers (x2): 10A7239, 1231919, 180863M91, 361700R91, 361700R92, 670935A, 721299, 764994M91, 99A501, AL16602, C0NN1050F, G12002, G47510, K67624, NCA1020B, T21741, TR1028, Z317. Reliable Aftermarket Parts is in not affiliated in any way with OEM manufacturers. We also carry replacement parts for the Boom Cylinder (Seal Kits, Tubes, Glands, Pistons, Rods). The item "2 Wheel Rims 10X28 6-Loop For John Deere 1840 2020 2040 2750 2755 2940 10-28" is in sale since Monday, November 14, 2016.